I built a couple more of these guns. I tried out some different colors and am quite pleased with the results! You can see the full set of photos here. 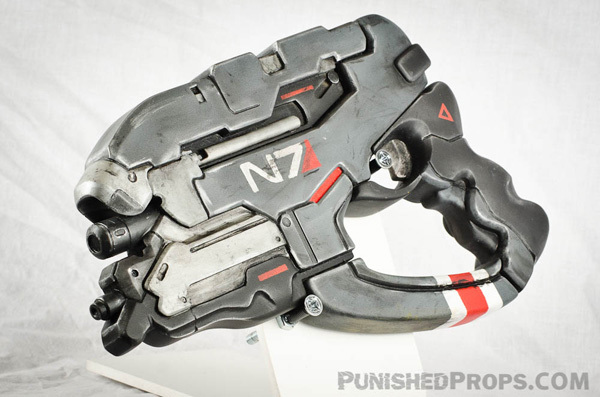 Apparently, to be a really cool prop maker, you have to make something from Mass Effect (i.e Volpin & Thorssoli). 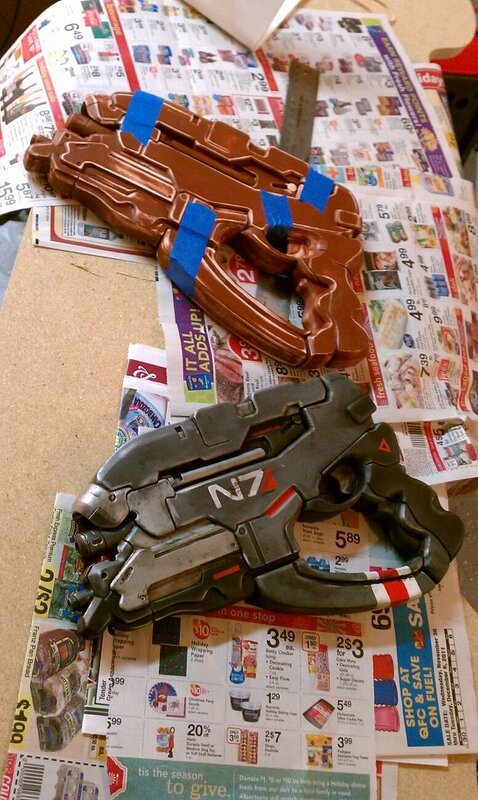 So, it was high time that I carved my own place in the Mass Effect prop replica making world. 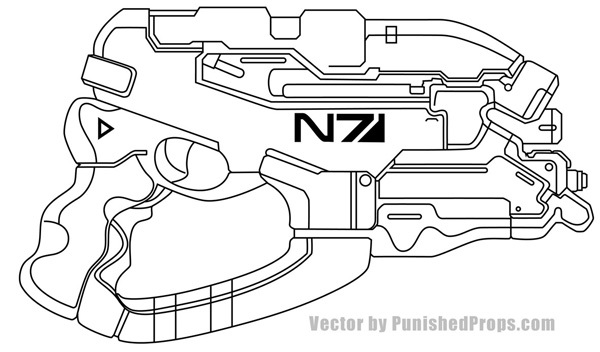 I decided to make the N7 pistol from the upcoming Mass Effect 3. 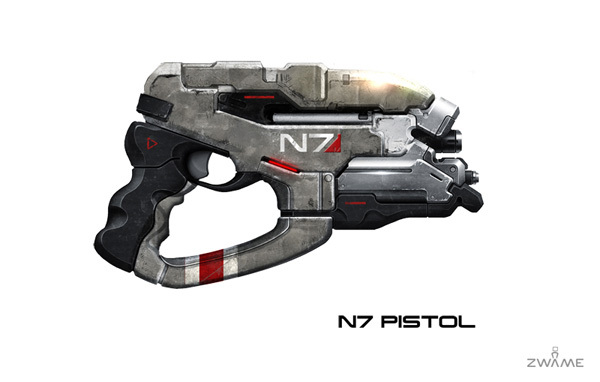 The game isn’t out yet, but I found a single reference image of the gun. 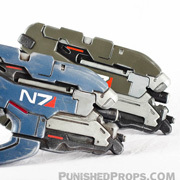 It’s based on the M5 Phalanx from a Mass Effect 2 DLC. 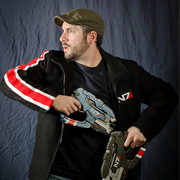 I was able to make a solid vector from this reference. 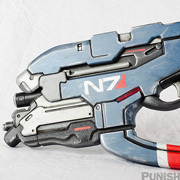 Building the master for this gun was very similar to the master of my Battlestar Galactica Colonial Handgun. 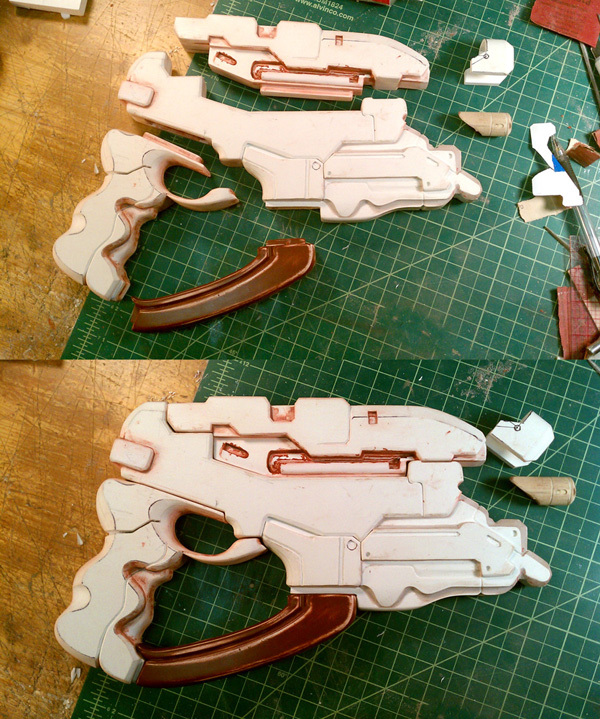 I used scraps of foam PVC, epoxy and Bondo for 95% of the construction. 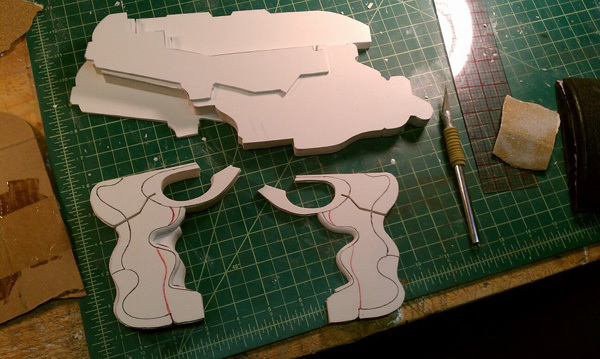 The pieces were built in layers of 3/8″, 1/8″ and 1/16″ foam PVC (Sintra). 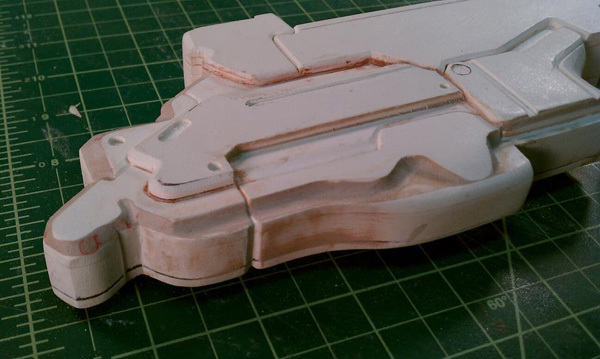 The main difference between this build and the BSG pistol is that this one was made in 4 pieces to facilitate molding and possibly adding electronics later. The gaps, fillets and rounds were filled in with Bondo and the smaller blemishes were filled with Bondo’s air drying glazing and spot putty (my new favorite element). Here you can see the 4 pieces together and exploded. I added grooves and tabs to all of the pieces so that they would all fit together snug when the cast pieces were assembled. Once the pieces were done, the traditional prime/sand/prime some more/sand some more routine was applied to get the pieces ready for mold making. Then the parts were clayed up and drowned in silicone. 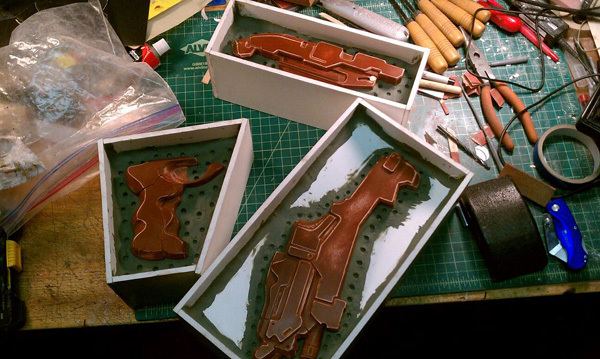 The parts were then cast in TAP Plastic’s Quik Cast plastic resin. I just picked up an air compressor and air brush on Black Friday, so the painting was done with a combination of air brushed enamel and brushed enamel/acrylic. I am beyond stoked about how this one came out. 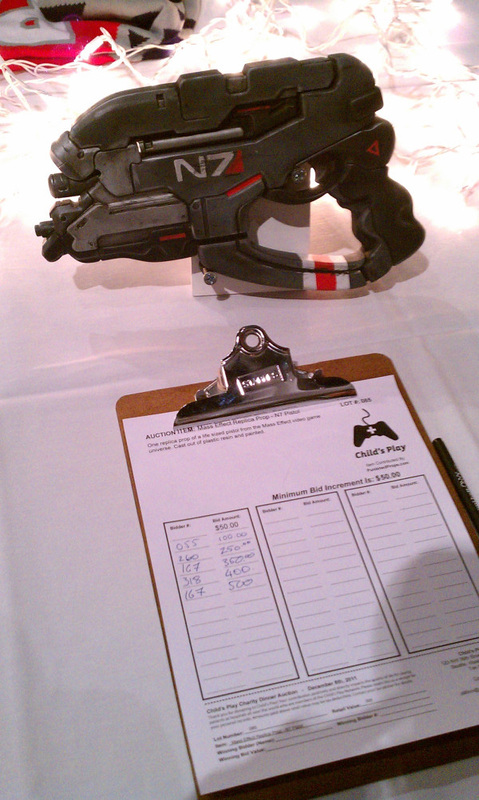 I may even paint one up and keep it for myself!